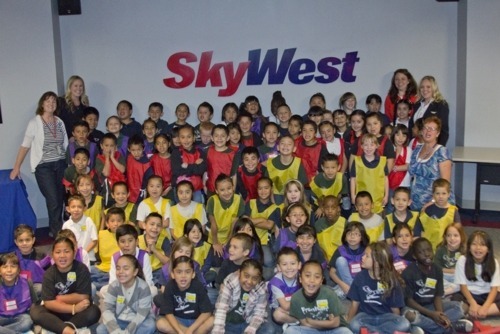 Underprivileged First Graders Explore Aviation at Our Salt Lake City SkyWest Training Center! What’s it like to introduce first graders to the world of aviation? Just ask SkyWest flight attendant and first grade teacher Christina Hathaway. In addition to being a flight attendant, Christina also teaches underprivileged students at Salt Lake City’s inter-city Franklin Elementary School. She recently organized a field trip for 80 students to visit SkyWest’s Salt Lake City training facility where they were introduced to the world of aviation. The kids were awestruck. When they first walked into the multimedia room to start their tour, one young boy asked if they were already in an airplane. Sonya Wolford, SkyWest Airlines’ VP of InFlight explained that they would have a chance to see the plane soon and the boy literally jumped for joy. During their visit, the kids were able to walk through various cabin trainers that simulate the inside of a CRJ200. They learned about important safety tasks that SkyWest flight attendants are required to know and had a chance to see some of the emergency equipment that is stored on board every SkyWest flight. Of course, no trip to the InFlight training facility would be complete without getting a package of Biscoff cookies and some pretzels.